Food Science and Safety is a specialization course in the CASE Program of Study. Students will complete hands-on activities, projects, and problems that simulate actual concepts and situations found in the food science and safety industry, allowing students to build content knowledge and technical skills. Students will investigate areas of food science including food safety, food chemistry, food processing, food product development, and marketing. Teachers are provided detailed professional development to facilitate instruction. 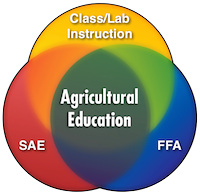 Every lesson is aligned with national standards for agriculture, science, mathematics, and English language arts. Learn more about the CASE Food Science and Safety course here. Click here to see what other CASE Institutes are offered nationwide! See which Nebraska teachers are already CASE certified! The CASE Institute is a professional development workshop to provide teachers training for the instruction related to a specific CASE course. Once a teacher has successfully completed the intense professional development at a CASE Institute,the teacher is certified to teach the specific CASE course. CASE Institute sessions provide teachers important background related to the pedagogy used in CASE curricula and practice teaching various lessons to prepare them for classroom instruction. Teachers are required to attend the entire 9-day workshop and CASE Institute instructors determine if each teacher is adequately prepared to provide instruction using CASE curricula. The 2019 Nebraska CASE Institute will take place Sunday, June 16, beginning at 6:00pm, wrapping up on Thursday, June 27. Lodging is included with your registration. Breakfast and other amenities are included. Request a single room for an additional charge by May 1 by emailing krystl.knabe@nebraska.gov. Check-in is at 3:00pm, though they may be able to get you in earlier, provided the room is ready. We will likely again stay at the Staybridge Suites on 84th & Holdrege in Lincoln! Weekday meals are included with your registration. Breakfast will be available at the hotel. Lunches will be provided on-site. Dinners will be provided at the hotel or may be on their own. Participants will receive a check upon arrival that can be used as an evening meal stipend for evening meals that are not organized as part of the institute. Please schedule travel arrangements to ensure your attendance at scheduled events. If you are flying, the Lincoln Airport is closest, but Omaha’s Eppley Airport may have more options and better rates. When booking flights, allow time for travel and check-in. Out-of-state participants car pooled with Nebraska teachers between the hotel and the institute location in previous years. Participants in the Institute may earn graduate credits through the University of Nebraska-Lincoln. Cost to attend the Nebraska CASE Institute is $2,700, which includes all training materials, access to laboratory equipment, lodging (double occupancy hotel room) and classroom facilities. Breakfast is provided each day at your hotel in the dining room. All other meals and breaks will be provided for during training days (Monday through Friday). Weekend meals are not included with the institute. Registration AND form of Payment is due by June 1, 2019. Cost for registration and payment received after June 1 is $3,000. (Please e-mail Krystl Knabe by this date if payment is on the way.) No reimbursements will be given for non-attendance. Click below to register for the Nebraska CASE Institute. Note: Registration goes live December 1. First come, first served! Registration is open to Nebraska teachers only through December, but opens nationally in January. TBA who payments and purchase orders should be made out to and sent to. Wondering what it costs to implement CASE beyond the training? See the list for laboratory materials and equipment on the CASE page. Nebraska teachers can apply for this scholarship to help fund their attendance to any CASE Institute. Through generous sponsors who believe in Agricultural Education and Family and Consumer Sciences Education and the impact they make on the lives of students, Nebraska teachers can apply for scholarships to cover the cost of attending the Nebraska Food Science and Safety CASE Institute. Twenty scholarships, ten for FCS and ten for AFNR instructors, in the amount of $2,700 from Partnership for Innovation (PFI) that teachers may use to attend the Nebraska Food Science and Safety Institute. Twenty 50% scholarships from the Nebraska Soybean Board that teachers may use to attend ANY CASE Institute or reimbursement for an estimated $1,400 for CASE curriculum equipment. See the scholarship application to see if you qualify! January 7, 2019 – Deadline for application of scholarships to the Nebraska Department of Education office. Selection of scholarship are based on order of receiving scholarship application via e-mail to Krystl Knabe at krystl.knabe@nebraska.gov for AFNR instructors and Kristin Vest at kristin.vest@nebraska.gov for FCS instructors. Two weeks following the conclusion of the CASE Institute: supplemental curriculum materials submitted and copy of press release to local media.